On the joyous occasion of Raksha Bandhan, make your bond stronger with your dear ones by ordering this Yummy Cadbury Celebration with Mixed Dry Fruits and Rakhi delightfully combined with a free Rakhi, Roli Tilak and Chawal. 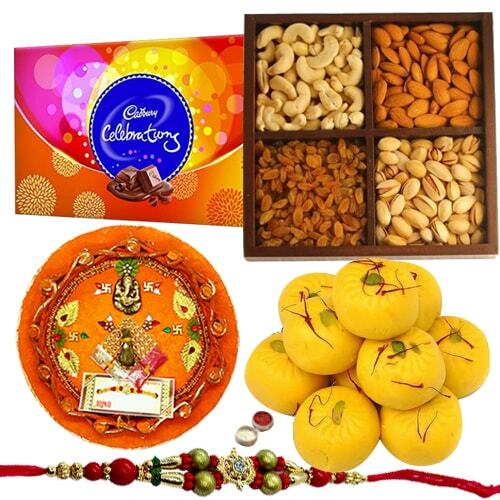 Celebrate in style with this exclusive Hamper that includes 1 Zardoji Rakhi, delicious pack of Cadbury Celebration, mixed Dry Fruits 250 gm., Haldiram Kesar Peda 250 gm. and a decorative Shree Thali.